Pew has created a new way of looking at Philadelphians, one rooted in how they think about the city rather than where they show up in demographic categories. 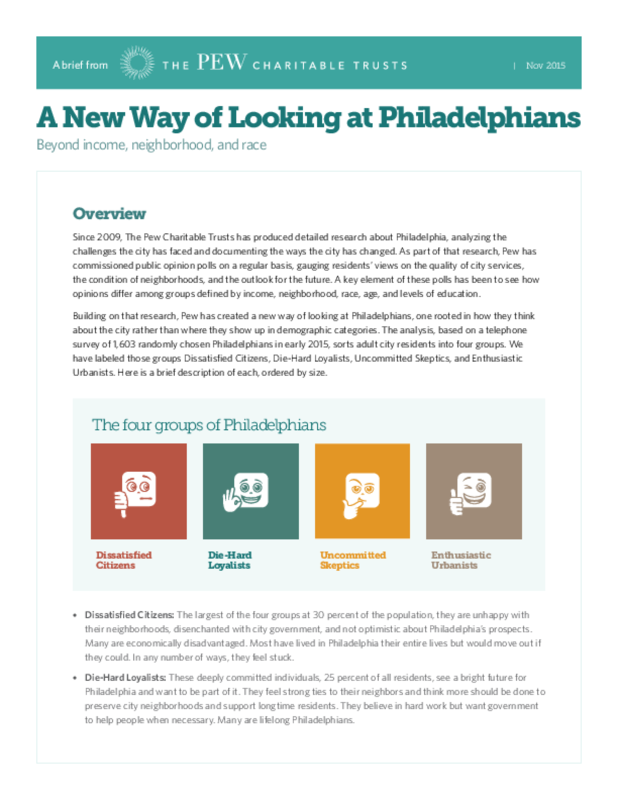 The analysis, based on a telephone survey of 1,603 randomly chosen Philadelphians in early 2015, sorts adult city residents into four groups. We have labeled those groups Dissatisfied Citizens, Die-Hard Loyalists, Uncommitted Skeptics, and Enthusiastic Urbanists. This effort was modeled on work done nationally by our colleagues at the Pew Research Center in Washington. Through this type of polling and analysis, the center has sorted Americans into groupings based on values and attitudes, going beyond the simple labels of liberal and conservative. For Philadelphia, we set out to do something similar -- although not on the left-right spectrum -- in hopes of increasing public understanding of the city and its residents.